One state down, 49 to go. The Washington state Department of Transportation is the first state DOT to endorse the Urban Street Design Guide put out by the National Association of City Transportation Officials’ (NACTO). 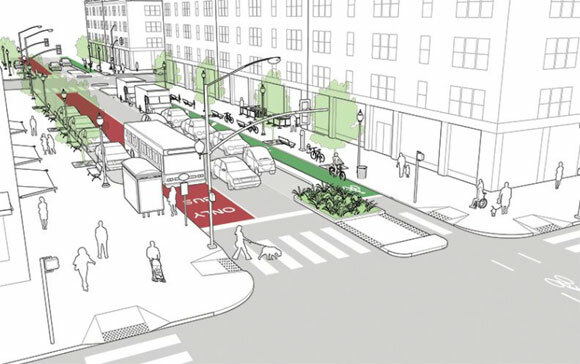 The manual provides instruction on creating treatments like protected bike lanes, transit-priority streets, and parklets, which aren’t included in the predominant American engineering guides. “We believe the low-cost innovations, interim solutions, and improvements outlined in the Guide can bring many significant benefits to communities across Washington in a short period of time,” wrote WDOT Secretary Lynn Peterson in a letter outlining the policy. While a growing number of cities are implementing features like pedestrian plazas and raised intersections, these treatments aren’t recognized by the AASHTO Green Book, a leading engineering manual. 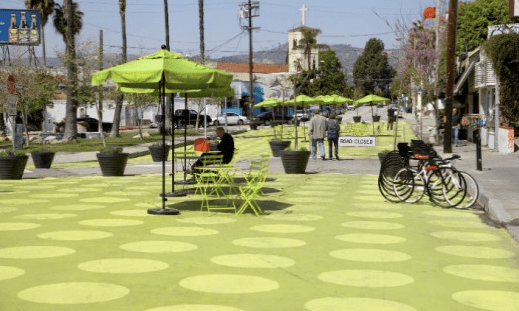 Lack of official recognition by state DOTs can make it difficult for cities to install these designs, especially on streets that happen to be classified as state highways. Now, cities and towns in Washington will have greater freedom to adopt the type of designs in the NACTO guide. NACTO’s David Vega-Barachowitz said he is hopeful Washington’s decision will encourage other states to endorse the guide. The states of Tennessee, Delaware and Massachusetts are currently reviewing it, he said. Two other states — Georgia and Massachusetts — have endorsed NACTO’s Urban Bikeway Design Guide. The document holding back innovation is not to a significant degree the MUTCD, which covers signs and pavement markings, but the AASHTO Guide for the Development of Bicycle Facilities, Guide for the Planning, Design and Operation of Pedestrian Facilities, and worst of all, A Policy on Geometric Design of Highways and Streets, which are all regressive. AASHTO represents the state agency focus on highways and motor vehicle dominance, while NACTO represents the city and regional focus on mobility and livability. Although a baby step forward, the NACTO guide is still dangerously amateurish in comparison to the world-class CROW traffic design engineering standards. 1) NACTO embraces door zone bike lanes. Yes, bike lanes placed in the door zone of adjacent parked cars. Where the most dangerous place on the entire road to ride… is in the bike lane. It is tremendously frustrating to encounter the sheer arrogance of the “not invented here” bureaucracy that insists upon spending huge amounts of taxpayer’s dollars on re-inventing the wheel. And then not even getting it right. The government of The Netherlands has figured out how to do traffic design engineering that works. Consistently works in all cities big and small. It is possible to go and see how well it works – I highly recommend David Hembrow’s study tours. Or watch Clarence’s excellent Streetfilms about Groningen and Amsterdam. These traffic design engineering principles that are so effective have been written down in the CROW manuals for the guidance of traffic design engineers. The Dutch government even translated them into English. All we have to do is open up the manuals and use them. Good point. We changed to reflect that. I agree with this. While I like that the NACTO guide is a step in the right direction, it still endorses (and therefore empowers DOTs to build) these dangerous bike lanes that are especially bad in the winter now! As well as the intersection design which you point out with the video reference. So far I have been in no American city that has solved the intersection conflict problem. NYC (lower 8th & 9th Aves) and DC (15th St) both have signal-protected bike lanes. These should have zero car-bike conflict at intersections, but at a cost of larger delays for people on bikes than with the mixing-zone design, since you have to devote separate signal phases for bicyclists going straight and for cars turning across the bike lane. With longer waits, you get less compliance with the signals by both drivers and cyclists, which isn’t great. Not sure what the solution is, though. It works better in the Netherlands, which has TONS of cyclists already, so you can give more time to cyclists and make them wait less. Over time it’ll sort itself out, but it’s hard to be too dogmatic on things like this or you’ll never build anything. I don’t think “officially endorse” means the same thing as “officially adopt.” Kinda like when Ray Lahood “endorsed” NACTO’s design guides, this appears to be a symbolic change, not a physical change. I hope I’m wrong but that appears to be the case. It works better in the Netherlands because where the signals are, they’re timed better too. We have signaled bike lanes in Chicago too and the timing is not great. I am not surprised that some people still run the lights, because you sometimes have to wait at every single one, while the car traffic has optimized signals for their speed. Also in the Netherlands the signals are timed for turns. I do not remember waiting a long time to make a turn in Amsterdam. Agreed. You could easily retime the signals on 8th & 9th in NYC to favor bikes, but the mode share for bikes is still so small (relatively), that it’s harder to justify. We’ll get there, but it’s a slow process, and there will need to be intermediate steps along the way. Better yet than signal timing is unravelling car and bicycle travel so that cyclists don’t encounter red lights in the first place. This is particularly important in New York where the number of traffic lights is mildly ridiculous. Yeah, you’re right. They said they are working on “adopting” the recommendations in the next few months though. But there is no concrete where the motorists and bicyclists actually cross paths. It still requires motorists to yield to cyclists when making a right turn. The only real way to have protected intersections is to signal separate the bike and turn phases, or have some sort of grade separation. Fact is that right turns are a problem in this country, but even in the Netherlands or in Denmark, most intersections rely on motorists yielding to bicyclists, which is a byproduct of good driver training, perhaps some enforcement, and overall good awareness and courtesy. But let’s not pretend the design above is “protected” when right turns and cyclists and going through the same space at the same time. If paint offers no protection at all, I wonder why we bother striping it to separate highway lanes? Watch the video again. The bike and turn phases are signal separated. “No right turn on red” is the rule for car drivers in The Netherlands. It’s right turn on green that is a problem. And the video does show a motorist and cyclist going through the same space at the same time. Watch it again. Headline should say “Washington State DOT…” lest it be confused with that other Washington, the one they built on a swamp.